Bullrace is one of Madura's culture, which become the special characteristis of Madura Island. 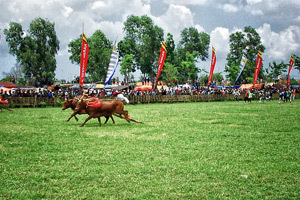 The beginning of the bullrace originated from the fact that Madura is not so fertile that is not good for agriculture, instead the Madurese cath fish and breed cows and bulls which are also used for farming especially to plough the fields where paddies or second crop plants are grown. A man named Syeh Ahmad Baidawi who firstly introduced the weay of working the soil with using bamboo sled pulled by two bulls known as " Nanggala or Salaga ". He was actually a proselytizer who came to Madura to spread up Islam but also taught Madurese the way of ploughing the fields. From this new knowledge that he had taught, he got tittle as "Pangeran Katandur" (Prince of Planter). The early purpose of bull race event is to get strong bulls for ploughing. The Madurese take care of the bulls and compete them in ploughing their fields as soon as possible. In this way the idea of competing come into existence and then developed into organized sport called "BULL RACE". The bull race soon becomes annually activities carried of every year especially when harvest on the fields has finished. It is a pride for Madurese to have a race bull. Therefore the bull owners will be very much happy and proud if their bulls win in the bullrace championship. To take care race bulls need much money for the bull owners have to prepare a variety of fodder, especially when they have been the champion. Leave of corn, bean and soybean trees and good grass are the special fodder for the race bulls. Besides that, the mixer of traditional spices like crushe ginger, peper, chili, honey, beer and tens even hundreds of eggs believed to warm and strengthen the bulls. The mixture is later forced into the mouth of the bulls with using a bamboo lath. To make the bulls strong and health the bull owners sometimes also massage them by treading their backs, train every weekly and at times lulled to sleep especially when the racing day is approaching. Three or four days before the racing day come, bull owners and their families crowd the surrounding of the racing track looking for good parking for the bulls, as on this particulary day black magic is common use among the bull owners. In this case, the one tries to over power bulls from the other. Fashing for the bull owners is also prepared as such is believed to give them the inner power and strength to defeat the black magic of others. Bullrace competition is always held in September, October and November every year, but one can also see bullrace when he needs if he serve first to the Tourism and Cultural Service, Husbandry Service or Paguyupan Kerapan Sapi (Group of Bull owners).